The Spartan army stood at the centre of the Spartan state, whose citizens' primary obligation was to be good soldiers. Subject to military drill from infancy, the Spartans were one of the most feared military forces in world history. At the height of Sparta's power – between the 6th and 4th centuries BC – it was commonly accepted that, "one Spartan was worth several men of any other state." The iconic army was first coined by the philosopher Lycurgus. In his famous quote of Sparta having a "wall of men, instead of bricks", he proposed to create a military-focused lifestyle reformation in the Spartan society in accordance to proper virtues such as equality, austerity, strength, and fitness. A Spartan man's involvement with the army began in infancy when he was inspected by the Gerousia. If the baby was found to be weak, he was left at Mount Taygetus to die. Those deemed strong were then put in the agoge at the age of seven. Under the agoge the young boys or Spartiates were kept under intense and rigorous military training. Their education focused primarily on sports and war tactics, but also included poetry, music, academics, and sometimes politics. Those who passed the agoge by the age of 30 were given full Spartan citizenship. The term "spartan" became synonymous with multiple meanings such as: fearlessness, harsh and cruel life, bland and lacking creativity, or simplicity by design. It is mostly used to describe a professional soldier or army. The first reference to the Spartans at war is in the Iliad, where they participate among the other Greek contingents. Like the rest of the Mycenaean armies, it was composed largely of infantry, equipped with short swords, spears, Dyplon (or Dipylon, an 8-shaped shield) and a simple rounded bronze shield. This was an age of heroic warfare with simple tactics, often little more than a general charge and a great deal of killing—it was common for entire armies to be chased down and killed after a rout. The basic tactic of battle was "free for all". War chariots were used by the elite, but unlike their counterparts in the Middle East, they appear to have been used for transport, with the warrior dismounting to fight on foot and then remounting it to withdraw from combat, although some accounts show warriors throwing their spear from the chariot before dismounting. Mycenaean Sparta, like much of Greece, was soon engulfed in the Dorian invasions, which ended the Mycenaean civilization and ushered in the so-called "Greek Dark Ages". During this time, spartan (or Lacedaemon) was merely a Doric village on the banks of the river Eurotas in Laconia. However, in the early 8th century BC, Spartan society was transformed. The reforms, which were ascribed by later tradition to the possibly mythical figure of Lycurgus, created new institutions and established the military nature of the Spartan state. This "constitution of Lycurgus" would remain unchanged in its essence for the next five centuries. From ca. 750 BC, Sparta embarked on a steady expansion, first by subduing Amyclae and the other settlements of Laconia, and later, in the First Messenian War, conquering the fertile country of Messenia. By the beginning of the 7th century BC, Sparta was, along with Argos, the dominant power in the Peloponnese. Inevitably, the two powers collided. Initial Argive successes, such as the victory at the Battle of Hysiai in 669 BC, led to an uprising of the Messenians, which tied down the Spartan army for almost 20 years. Over the course of the 6th century BC, Sparta secured her control of the Peloponnese peninsula: Arcadia was forced to recognize Spartan overlordship, Argos lost Cynuria (the SE coast of the Peloponnese) in ca. 546 and suffered a further crippling blow by Cleomenes I at Sepeia in 494, while repeated expeditions against tyrannical regimes throughout Greece greatly raised their prestige. By the early 5th century BC, Sparta was left the unchallenged master in southern Greece, as the leading power (hegemon) of the newly established Peloponnesian League (which was more characteristically known to its contemporaries as "the Lacedaemonians and their allies"). By the late 6th century BC, Sparta was recognized as the preeminent Greek city-state. King Croesus of Lydia established an alliance with the Spartans, and later, the Greek cities of Asia Minor appealed to them for help during the Ionian Revolt. In the second Persian invasion of Greece, under Xerxes, Sparta was assigned the overall leadership of Greek forces on land and at sea. Because of this, the Spartans played a crucial role in the repulsion of the invasion, notably at the battles of Thermopylae and Plataea. In the aftermath, however, the plottings of Pausanias with the Persians and the unwillingness of the Spartans to campaign too far from home, meant that they withdrew into a relative isolation, leaving the rising power of Athens to assume the reins of the continued effort against the Persians. This isolationist tendency was further reinforced by the revolts of some of her allies and a great earthquake in 464, which was followed by a large scale revolt of the Messenian helots. The parallel rise of Athens to a major power in Greece led inevitably to friction with Sparta, and to two large-scale conflicts, (the First and Second Peloponnesian Wars), which devastated Greece. Sparta suffered several defeats during these wars, including, for the first time, the surrender of an entire Spartan unit at Sphacteria in 425 BC, but ultimately emerged victorious, primarily through the aid it received from the Persians. Under its admiral Lysander, the Persian-funded Peloponnesian fleet captured the cities of the Athenian alliance, and a decisive naval victory at Aegospotami forced Athens to capitulate. The Athenian defeat left Sparta in a dominant position in Greece, and Sparta finally gained primacy due to its military forces. This Spartan ascendancy did not last long. Sparta had suffered serious casualties in the Peloponnesian Wars, and its conservative and narrow mentality soon alienated many of its erstwhile allies. Thebes repeatedly challenged their authority, and the ensuing Corinthian War led to the humiliating Peace of Antalcidas, which destroyed Sparta's reputation as the protector of the independence of Greek city-states. At the same time, the Spartan military prestige suffered a severe blow when a mora of 600 men was decimated by light troops (peltasts) under Iphicrates. Despite her continuing military prowess, Sparta was incapable of projecting her power over the entirety of Greece, suffered from manpower shortages and was unwilling to reform. As a result, Sparta's strength collapsed after the disastrous defeat suffered at the Battle of Leuctra by the Thebans under Epaminondas in 371 BC. The battle resulted in the loss of large numbers of Spartiates and the loss of Messenia. During the absence of Alexander in the East Agis III revolted, but was defeated. After Alexander's death, Sparta again became involved, as an independent state, in the many wars of the 3rd century. Under the reformist kings Agis IV and Cleomenes III, it enjoyed a short-lived revival, scoring successes against the Achaean League, before the final defeat in the Battle of Sellasia. The last Spartan resurgence occurred under Nabis, but following Sparta's defeat in the War against Nabis, the city was incorporated into the Achaean League in 189 BC. This marked the end of Sparta as an independent power, thereafter coming under Roman rule, although retaining the status of an autonomous city. The Spartan people (the "Lacedaemonians") were divided in three classes: Full citizens, known as the Spartiates proper, or Hómoioi ("equals" or peers), who received a grant of land (kláros or klēros, "lot") for their military service. The second class were the Perioeci (the "dwellers nearby"), free non-citizens, generally merchants, craftsmen and sailors, who were used as light infantry and on auxiliary roles on campaign. The third and most numerous class were the Helots, state-owned serfs used to farm the Spartiate klēros. By the 5th century BC, the helots too were used as light troops in skirmishes. The Spartiates were the core of the Spartan army: they participated in the Assembly (Apella) and provided the hoplites in the army. Indeed, they were supposed to be soldiers and nothing else, being forbidden to learn and exercise any other trade. To a large degree, the necessity for the constant war footing of the Spartan society was the need to keep the vastly more numerous helots subdued. One of the major problems of the later Spartan society was the steady decline in fully enfranchised citizens, which also meant a decline in available military manpower: the number of Spartiates decreased from 6,000 in 640 BC to 1,000 in 330 BC. The Spartans were therefore forced to use helot hoplites, and occasionally they freed some of the Laconian helots, the neodamōdeis (the "newly enfranchised"), and gave them land to settle in exchange for military service. The Spartans used the same typical hoplite equipment as the other Greek neighbors; the only distinctive Spartan features were the crimson tunic (chitōn) and cloak (himation), and long hair, which the Spartans retained to a far later date than most Greeks. To the Spartans, long hair retained its older Archaic meaning as the symbol of a free man; to the other Greeks, by the 5th century, its peculiar association with the Spartans had come to signify pro-Spartan sympathies. Another widely known Spartan symbol, adopted in the 420s BC, was the letter lambda (Λ), standing for Laconia or Lacedaemon, which was painted on the Spartans' shields. Shields were of such great importance in the Spartan army that while losing a sword and a spear was an exception, to lose a shield was a sign of disgrace. Not only does it protect the user, but it also protects the whole phalanx formation. To come home without the shield was the mark of a deserter, rhipsaspia or "dropping the shield", was a synonym for desertion in the field. Mothers bidding farewell to their sons would encourage them to come back with their shields, often saying goodbyes like "Son, either with this or on this" (Ἢ τὰν ἢ ἐπὶ τᾶς). Spartan hoplites were often depicted bearing a transverse horsehair crest on their helmet, which was possibly used to identify officers. In the Archaic period, Spartans were armored with flanged bronze cuirasses, leg greaves, and a helmet, most usually of the Corinthian type. It is often disputed which torso armor the Spartans wore during the Persian Wars, though it seems likely they either continued to wear bronze cuirasses of a more sculptured type, or instead had adopted the linothōrax. During the later 5th century BC, when warfare had become more flexible and full-scale phalanx confrontations became rarer, the Greeks abandoned most forms of body armor. The Lacedaemonians also adopted a new tunic, the exōmis, which could be arranged so that it left the right arm and shoulder uncovered and free for action in combat. The Spartan's main weapon was the Doru. For long range, they carried a javelin. The Spartiatēs was always armed with a xiphos as a secondary weapon. Among most Greek warriors, this weapon had an iron blade of about two feet (.6 m), however, the Spartan version was typically only 12–18 inches. The Spartan's shorter weapon proved deadly in the crush caused by colliding phalanxes formations – it was capable of being thrust through gaps in the enemy's shield wall and armor, where there was no room for longer weapons. The groin and throat were among the favorite targets. In one account, an Athenian asked a Spartan why his sword was so short and after a short pause he replied, "It's long enough to reach your heart." As an alternative to the xiphos, some Spartans selected the kopis as their secondary weapon. Unlike the xiphos, which is a thrusting weapon, the kopis was a hacking weapon in the form of a thick, curved iron sword. 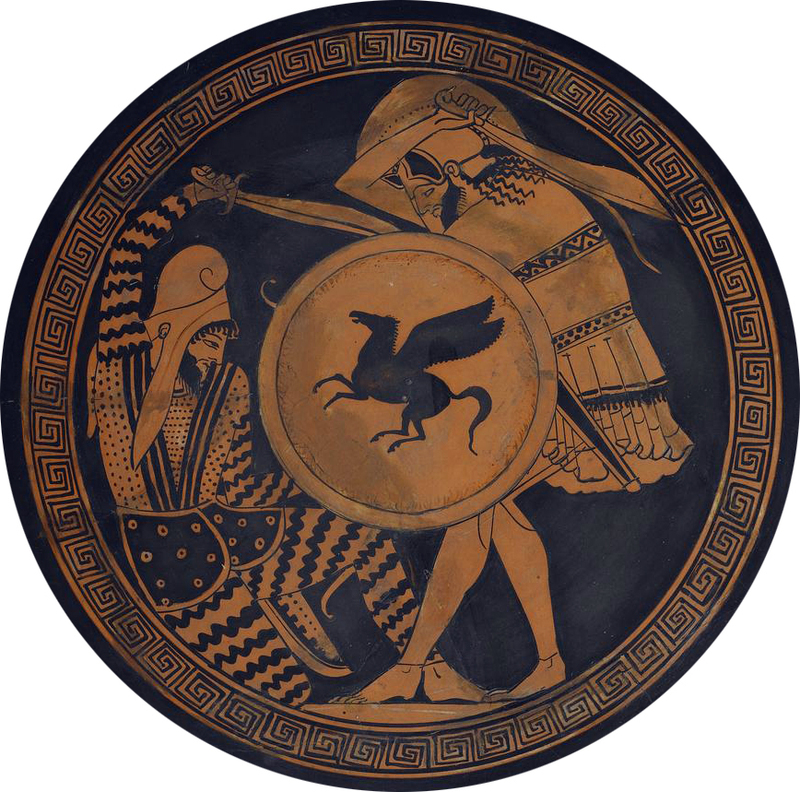 In Athenian art, Spartan hoplites were often depicted using a kopis instead of the xiphos, as the kopis was seen as a quintessential "bad guys" weapon in Greek eyes. Spartans trained in pankration, a famous martial art in Ancient Greece that consisted of boxing and grappling. Spartans were so adept in pankration that, when it was inducted in the Olympics, they were mostly forbidden to compete. 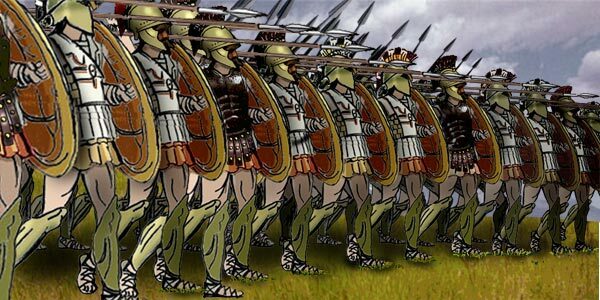 The Spartans retained the traditional hoplite phalanx until the reforms of Cleomenes III, when they were re-equipped with the Macedonian sarissa and trained in the style of the Phalanx. Contrary to popular belief, Spartans valued knowledge and education as much as the Athenians did. Spartan philosophers include Lycurgus and Chilon of Sparta. Although Athens has been praised as the "inventor" of democracy and philosophy, Sparta often has been viewed in popular culture as a society characterized by brutal, mindless discipline and merciless emphasis on physical fitness, and as an example of an early communistic or socialistic society. Sparta, however, had its own democratic government. In the Appella or Demos as early as 700 BC, Spartans elect leaders and voted by range voting and shouting. Every male age 30 and above could participate. 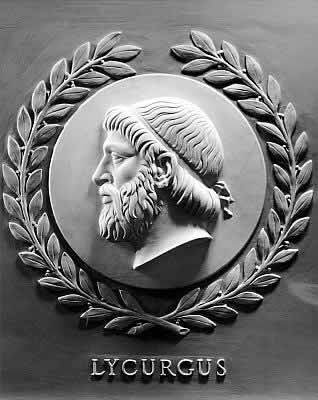 Aristotle called the Spartan electoral process "childish" in contrast to the stone ballots cast by the Athenians. Sparta adopted its procedure for the sake of simplicity, and to prevent any bias voting, bribing, or cheating that was predominant in the early democratic elections. Self-discipline, not kadavergehorsam (mindless obedience) was the goal of Spartan education. Sparta placed the values of liberty, equality, and fraternity at the center of their ethical system. These values applied to every full Spartan citizen, immigrant, merchant, and even to the helots, but not to the dishonored. Helots are unique in the history of slavery in that unlike traditional slaves, they were allowed to keep and gain wealth. They could keep half their agricultural produce and presumably sell it; thus accumulating wealth. There are known to have been some occasions that a helot with enough money was allowed to purchase their freedom from the state. Foremost, unlike other slaves, helots could not be bought and sold by their owners, as they were more like property of the state. The fleet was commanded by navarchs, who were appointed for a strictly one-year term, and apparently could not be reappointed. The admirals were subordinated to the vice-admiral, called epistoleus. This position is seemingly independent of the one-year term clause, because it was used, in 405 B.C. to give Lysander command of the fleet after he was already an admiral for a year. Their helmets were made of bronze or silver and the plume was made of horse hair. The term "spartan" became synonymous with fearlessness, harsh and cruel life, bland and lacking creativity, or simplicity by design. These characteristics is also derived from Spartan culture. On the television program Deadliest Warrior, out of 1,000 battles, the Spartan defeated the Ninja 653 times compared to 347 for the ninja defeating the Spartan. The majority of these kills were done surprisingly by the shield, which was said to deliver a blow whose force far exceeded that of car crash traumas. On Season 2, they brought back the Spartan vs. the Samurai to declare the deadliest ancient warrior, in which the Spartan beat the Samurai 527 kills to 473. Many colleges and universities have the Spartan as a school mascot, some of which include San Jose State University and Michigan State University (see also Sparty, Michigan State's costumed mascot). The Spartan South Midlands Football League is an English football league named after them. ↑ 5.0 5.1 5.2 Lane Fox, Robin. The Classical World: An Epic History from Homer to Hadrian. Basic Books. ISBN 0-465-02496-3. ↑ 11.0 11.1 Holland, Tom. Persian Fire: The First World Empire and the Battle for the West. Anchor. ISBN 0-307-27948-0. ↑ 32.0 32.1 "Spartan armor". Marvel Comics. July 16, 2012. http://www.mlahanas.de/Greeks/war/Armor2.htm. Retrieved July 16, 2012.